(Synopsis) Lena Wise is always looking forward to tomorrow, especially at the start of her senior year. She's ready to pack in as much friend time as possible, to finish college applications and to maybe let her childhood best friend Sebastian know how she really feels about him. For Lena, the upcoming year is going to be epic—one of opportunities and chances. I had to psych myself up to read this one. Not because I was afraid I wouldn't like it. 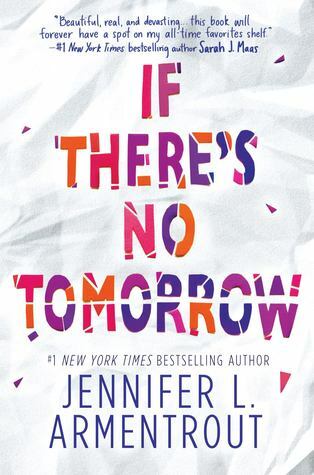 After reading The Problem With Forever, I knew that Jennifer Armentrout could do an emotional YA contemporary so well. No - it was the fact that I knew it would slay me, and I had to gear myself up for the tears. I mean, that description, right?? It sounds so ominous and unfortunate. It sounds like death is involved somehow, and knowing these are kids, any death in their young lives is going to be tragic. But, despite the fact that I had the book in my hand for a few weeks before I actually started reading it, I did love it. Lena's a book fan who has a large circle of friends including three best girl friends and one best guy friend. She's a moderately good volleyball player, a good student and has a great mom (although, her dad is another story). She worries about all the typical things 17-year-old girls worry about - what college will she go to and what will she study? How could she have let that guy kiss her last month? And why does she have to have feelings for her best guy friend Sebastian? Then, one choice on one night changes her world in a tragic way. I think, for me, one of the things about this book that made it especially emotional is that everything that happens to Lena has happened to other teens in America countless times over. Perhaps not always with the same outcome, but kids grapple with the choices Lena faced, and I'm sure they make the same one. I want my daughter to read this book when she gets to high school, and I hope she makes some sort of connection with the characters and uses it as a reference if she finds herself in a similar situation. Never fear all you romance lovers out there - despite the deep and heavy subject matter, there is plenty of romance in If There's No Tomorrow to sink your teeth into. Things between Sebastian and Lena develop at such a great pace. The romance never seems to be thrown in there in a haphazard way, as romances sometimes seem when they're overshadowed by the larger story arc. Lena's way of dealing with what happened remains always at the forefront, and how her relationship with Sebastian develops is shaped because of that larger story arc. It's as it should be, even if it is incredibly frustrating to read at times. If There's No Tomorrow is told entire from Lena's POV. In some of Jen Armentrout's previous books, she's gone back later and posted on her website portions of her books written from the guy's POV. I would LOVE to get some of that here. There's no doubt that this is entirely Lena's journey, so it's only right that it be told all by her. But, there are some parts of the story, that I would've loved to have known what was going through Sebastian's head. That would be an amazing extra. I'm a huge Jen Armentrout fan. She's so versatile - able to write emotional YA contemporary one month and adult romantic suspense the next. And she does them all so very well. If There's No Tomorrow will gut you and frustrate you. It will make you cry and make you smile a little from time to time too. And it's one that will stay with you for a long time.